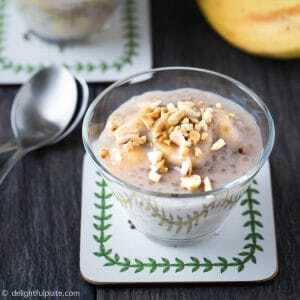 Banana Tapioca Pudding (Che Chuoi) is an excellent Vietnamese warm dessert for winter. The creamy sweet coconut soup, fruity scent of bananas, and slightly chewy tapioca pearls are some of the things to like about this delicious dessert. One of the most common desserts in Vietnam is sweet soup (or che in Vietnamese). It doesn’t require any complicated or fancy equipment to make as many Western desserts. We usually simmer beans, fruits or seeds in water or coconut milk with sugar to create delicate sweet soups. Most sweet soups can be enjoyed either warm or cold though I find that some of them are particularly better when warm and vice versa. 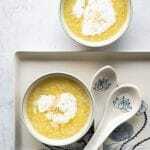 Banana Tapioca Pudding (Che Chuoi) is a simple and dairy-free sweet soup of Southern Vietnam. 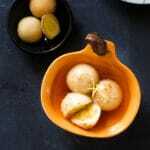 Its texture is thick and creamy, somewhat like Western pudding. 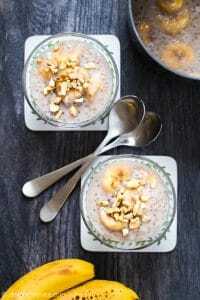 To make it, you only need a saucepan and simple main ingredients which are ripe bananas, coconut milk, small tapioca pearls, sugar and roasted peanuts. 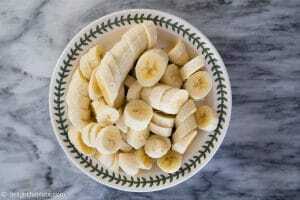 It’s best to use ripe bananas because we need to infuse the soup with banana scent and natural sweetness. Though ripe, the bananas should still feel firm so that they can maintain their shape in the soup. Since the dish has a lot of bananas, we only need to use a small amount of sugar. Vietnamese sweet soups are usually not so sweet and utilize the natural sweetness of ingredients. If you can find small bananas, that’s even better since those are sweeter than the regular ones. The type of tapioca pearls used in this banana tapioca pudding is the small one. I used Bob Red Mill’s small tapioca pearls which I found at my local Western grocery store. Asian grocery stores also sell these pearls. It’s been a month since I last posted on the blog because we were traveling back to Vietnam during the last few weeks. We left on Christmas night, and we prepared and took photos for this recipe on Christmas morning :). I thought I would be able to post it when I was in Vietnam. However, I was busy spending time with family and eating Vietnamese food I missed as well as trying out new dishes. As a result, I delayed posting it until today. Happy New Year and I hope to share with you the dishes I learned during my trip in the upcoming weeks. 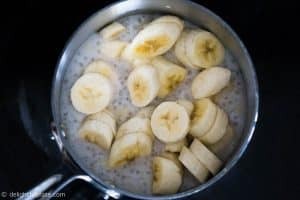 Banana Tapioca Pudding (Che Chuoi) is an excellent Vietnamese dessert to use up extra bananas in your kitchen. The creamy coconut soup, fruity scent of bananas, and slightly chewy tapioca pearls are some of the things to like about this delicious dessert. 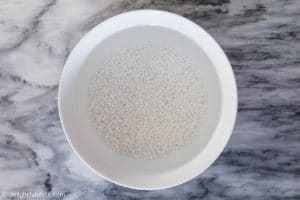 Soak tapioca pearls in plenty of water (about 2-3 cups) for an hour. Peel and slice bananas into 3/4-inch thick slices. Set aside. Drain tapioca pearls. 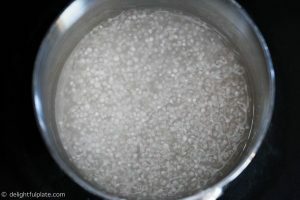 In a saucepan, bring 1 cup of water to a boil, add tapioca pearls and lower the heat to medium low - medium. Cook and stir frequently to prevent scorching until tapioca pearls are almost clear, some may have a tiny white dot in the center (about 4-5 minutes). Add coconut milk and sugar, stir and cook until the tapioca pearls are all transparent and the mixture comes to a near boil. You can add more coconut milk if you want a thinner soup. Add banana slices, stir gently and let the mixture simmer for 2-3 minutes until bananas are slightly soft and flavors come together. Taste and add more sugar to your liking. 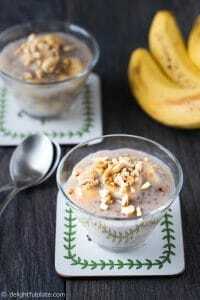 Divide banana tapioca pudding into serving glasses and sprinkle with roasted peanuts.